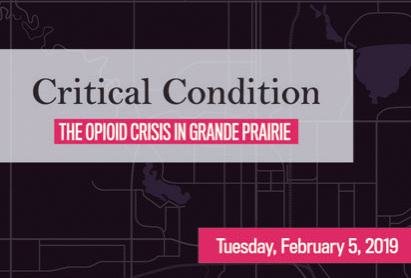 So great is the interest in a new video series titled “Critical Condition: The Opioid Crisis in Grande Prairie", which premieres tonight, Feb. 5, that organizers of the screening had to change the venue to a larger one. The Douglas J. Cardinal Performing Arts Centre at the Grande Prairie Regional College will host the free event. Call to register 780-538-1616 to ensure you have a seat. The premiere will be held from 7 p.m. to 9 p.m. Doors open at 6:30 p.m. The video series raises awareness about the opioid crisis hitting the Alberta city and features profiles of individuals who have lived through the opioid experience, family members affected by it, front-line workers and others impacted. Angela Sutherland, manager of community and social development for the City of Grande Prairie said the series hopes to engage the community and spark discussion about the crisis among community members to reduce stigma. Tyla Savard is a community member in Grande Prairie with lived experience of opioid use in her family. About six years ago, when Fentanyl was becoming a household name, there was no information to be found on the Internet about the drug or its affects . Savard’s oldest daughter, now in recovery, became involved with opioid use. Tyla described her family’s situation as a deep, dark secret, and their thinking that they were the only ones going through such a situation. Finding help for her daughter led Tyla to question a lot, about the drug and its widespread use in the city. “Why was this so hard in our community. Why do we have these gaps. Why don’t we have this information,” she said of the process her family went through. “You’re drowning. You have no control over life. You can’t even get control to focus a thought,” Tyla said. She said open discussion about opioid use should happen before families and individuals hit rock bottom. Tyla put together a Fentanyl: What you need to know community engagement event. It was enough to get the conversation happening. Then the mayor initiated the task force. It’s a complex issue with multiple community perspectives. A question and answer period with a panel of people with lived experience and including front-line workers is scheduled to follow the screening. The Grande Prairie Community Opioid Response Task Force commissioned the video series. The task force was launched in December 2017 by Mayor Bill Given in response to the opioid crisis in Grande Prairie. It is composed of social service agencies, health care representatives, RCMP, members of the business community, school district representatives and several municipal government departments.